Anti-Aging Developments, May 31, 2011 -- In his recent newsletter, Dr. Sears, talks about a form of an ancient Chinese healing method called auriculotherapy or ear acupuncture. Ear acupuncture has been used for centuries to treats conditions like chronic pain and addictions, whether they be alcohol, nicotine or other drugs. It is also used to treat nausea and high blood pressure. But it wasn’t until the 1950s that this technique became better known, when it was introduced by French physicist Dr. Paul Nogier. 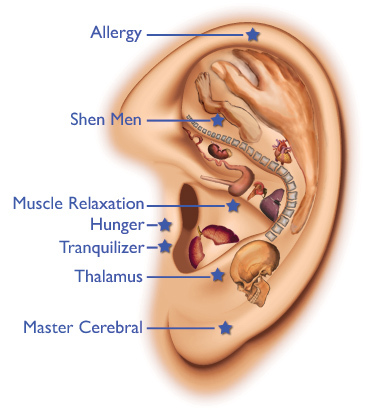 Dr. Nogier realized that the outer ear was a “map” of the body, corresponding to different systems and organs. By simply pressing on specific trigger points on the outer ear, it is possible to help relieve pressure or aches and pains. Anti-Aging Developments, May 31, 2011 -- Two professors from the School of Medicine at Tehran University of Medical Sciences have conducted several studies that support the belief that saffron is as effective as Prozac at alleviating the symptoms of depression, without any of the unpleasant side effects. Dr. Noorbala who is also MD at Roozbeh Hospital in Tehran and specializes in psychiatry conducted the initial studies. Follow-up studies were made in collaboration with Professor Shahin Akhondzadeh who is also a member of the Psychiatry Department and has a Ph.D. in Clinical Psychopharmacology. Both scientists have published over 40 peer-reviewed articles. Dr. Noorbala’s original study followed 40 adults with mild to moderate depression for six weeks, directly comparing an extract of saffron to fluoxetine, also known as Prozac. Half the patients were given 30mg of saffron and the others 20mg of Prozac. The results showed little difference in the efficiency of one treatment over the other. A follow-up study by the two professors administered a placebo to one group and saffron to the other. The group on saffron had a slightly better outcome than the patients who were given a placebo. In the second follow-up study patients were given the same doses of the drug and the spice as in the original study, but this was administered twice daily and the group was followed for an extra two weeks. The results were similar in that both the drug and saffron showed a remission rate of 25 percent. According to the World Health Organization (WHO), depression affects 121 million worldwide. Over 40 million are on Prozac, but recent findings, including one published recently in the Journal of the American Medical Association (JAMA) indicate that antidepressants are not working for many people. Studies including one by the National Institute of Mental Health (NIMH) showed that Prozac can cause sexual dysfunction, insomnia, nervousness, and agitation. Consequently, Professor Irving Kirsch of Hull University who led the JAMA study suggests that only severely depressed patients should be given these drugs, unless alternative treatments have failed. What is Saffron?Saffron a spice made from the dried stigmas of a purple flower called Crocus sativus. The spice has over 3,500 years of cultural history and was used as a fragrance, a dye and a spice by ancient Sumerian kingdoms.